(CNN) - Republican Gov. Bob McDonnell of Virginia sharply tamped down rumors that he may be resigning as part of a plea deal with federal prosecutors. "I don't know where these things come up. Some of the press accounts have just been completely out of control about rumors, about resignation, so forth," he told CNN affiliate WTVR in an interview that ran Tuesday. "Thirty-seven years–no one's raised questions about my integrity or my character," he said. A conservative blog, The Bearing Drift, made the initial report on Saturday, prompting McDonnell's spokesman to denounce the rumor as "false" on Twitter. McDonnell has been under investigation by the FBI for his relationship with a certain donor who provided multiple gifts, including large financial contributions, to the governor and his family. The latest allegations, reported by The Washington Post on Wednesday, revealed the donor, Jonnie Williams Sr. had given $70,000 to a corporation owned by McDonnell and his sister, and a separate $50,000 check to McDonnell's wife. Williams owns a dietary supplement company that the McDonnells have promoted in recent years. The FBI has not made any announcements about the investigation, nor has it given any indication that the governor will be charged. For his part, McDonnell maintains that the company has not received special state support, such as state benefits, economic development grants, targeted money from the budget, or board appointments. "They've really–they've received nothing," he said in the WTVR interview. As for the resignation speculation, the governor–whose term ends at the start of next year–said there have been "a number of irresponsible" press reports and rumors. "I am thoroughly enjoying and being incredibly productive, I think, with my team as governor of Virginia," he said. 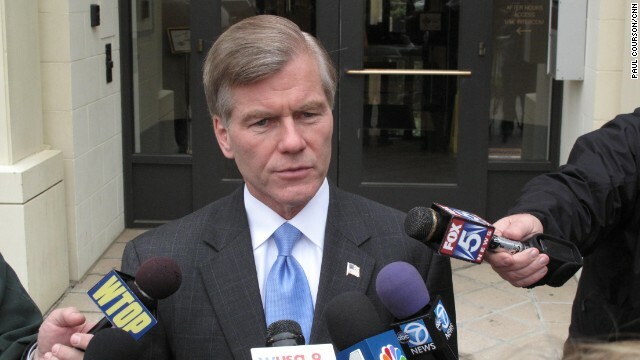 Virginia law prohibits governors from serving consecutive terms, so McDonnell is not running in this year's gubernatorial election. A plea deal with federal prosecutors. IF Romney would have won the election , this wouldn't be happening ! than (fill in the blank)? Your a thief and the poster boy for the new and improved gop garbage of America party, you might as well quit before they come in and drag you out of the governors mansion in cuffs on national tv, GOP loser!!!!! Sorry. He's guilty. He's been accused and that's all it takes. Just ask Issa. If he wants to be found innocent, then he bears the burden of proof...otherwise, the accusations are sufficient to justify the hanging. Boy if McDonnell had been a democrate this site would been full of vermen screaming to do all sorts of unkind things to him but then again its normal for a ethically,morally corrupt republican and life goes on doesn't it hypocrites! !Republican governors always get free Rolexs,paid weddings for relatives and other freebies right! !O and those checks made out as donations to him are tax deductible aren't they!! Maybe if he is charged, he can pay a fine and stay in office. Isn't that how it works. Like if I steal a TV set and pay a fine, then I get to keep the TV. Or if you are in this country illegally, you pay a fine and then move ahead of all who are legally waiting to LEGALLY come here. You wouldn't be responding to the "rumors" Gov. McCorrupt if they didn't have any truth to them. Go ahead and fess up and admit you're a crook, cheapskate, welfare queen, whatever! Just resign. Governor V@ginal probe ain't going nowhere and he probably won't even be prosecuted. Bob, you reap what you sow. "I will never vote for a Republican again!" That's a good one!! Wish I thought you were serious. I will never vote for a Republican again! Looks like the REAL Ray E. has a stalker... how cute is that? Here in Georgia, when the ethics board is investigating the Republican Governor, the Gov just defunds the ethics board. Guess that's not an option in this case. If he's a republican, he lies whenever his mouth moves. Just more of the liberal smear machine in high gear. Nothing new to see here. "Just more of the liberal smear machine in high gear." Right. I mean, we don't even need to see this guy's birth certificate to know he's innocent...just look at him and you can 'tell." Hmmm? Here's something that's not a rumor. McDonnell cheated taxpayers and had to reimburse them. He was explicitly told that the items he charged to the state were not permitted. Well, guess what? He has to write another check because he has continued on charging the same non-permitted items to the state. "Like if I steal a TV set and pay a fine"
Analogy fail. Stealing is a crime. Illegal immigration is not. Try again. You're not paying attention. The rumors are originating from decisively right wing blogs and media. WP is repeating it. Govenor free stuff. Extremist wingnuts involved,ALWAYS follow the money. In the past, these spoofs have more times than not seem to be the work of libertarians. Look around. Who's not here? Oh poor little probe governor of Virginia. Even cuchimamma is running as fast as he can from you. Those gifts, excuse me, loans from almost complete strangers? LIAR!!! A "good" Christian University education and he must believe he is the "Chosen One." He is the most current example of self righteous, anti-women's health, anti-minorities and anti-midlle-class Rethugnicain thief. Who is the next Virginian religious GOP thug wanting to be Govenor? That is right an even more self righteous Christian zealot – "The Cutche." He is also a slimeball. Opps... sorry for the spelling error. The current LT. Govenor and GOP Govenor canidate is "The cuche." Yes, he is digusting as the nick name implies. He just can't keep his religion out of the reproductive system of women.